A few weeks ago, my eldest (8 years) and I, headed along to The Warner Bros Harry Potter Studio Tour. We went with my old school friend and her son – we’d decided to buy the boys an ‘experience’ as part of their Christmas gift as they always end up with so many gifts. 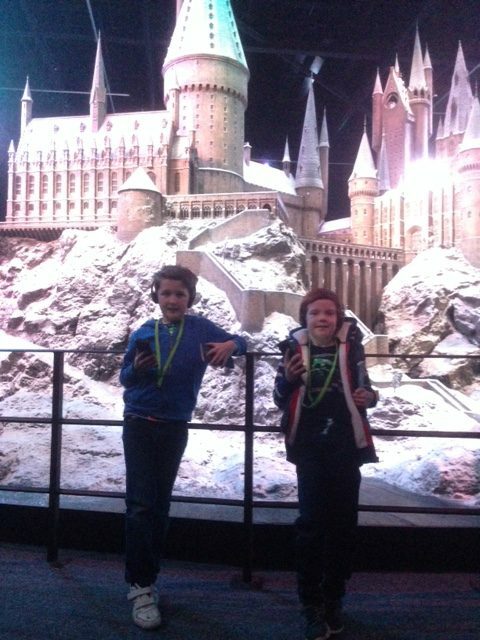 Both boys had read a few of the books and seen a few of the films so we thought this would make a fun day out for them. I’ve included below some top tips for visiting Harry Potter World – please comment below if we’ve missed anything off. BOOK IN ADVANCE: If you have a specific date in mind, it’s worth booking early as it’s a popular day out and dates tend to sell out early. Availability is especially limited on weekends and school holidays, so advance booking is recommended. 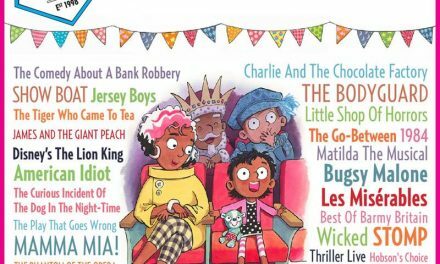 Family tickets are offered and children aged four and under go free! ARRIVE EARLY: Our tour was supposed to start at 5.30pm – we arrived early, planning to go to the café first, but were lucky enough to get early entry which was great as we ended up being at the Studio for about 3.5 hours. AUDIO GUIDE: Don’t forget to book a digital guide as this gives you so much insider info. Available in nine languages, the Digital Guide features behind-the-scenes extras including an exclusive clip from Daniel Radcliffe’s first audition. For convenience, you can pre-book these with your tickets and discounted family packages are available (details below). The guide costs £4.95 and basically narrates your journey around the tour to you through headphones. HARRY POTTER PASSPORT: When you arrive on site, make sure you pick up a Potter Passport for your children – they make a great souvenir plus they are free and include a treasure hunt. The kids can get their passports stamped at key points throughout the tour as well as searching for the Golden Snitchs hidden throughout the tour. There are also lots of questions to answer about the making of the Harry Potter film series. START OF THE TOUR: When you first go into the tour, you’ll be taken into a room with screens on the side. Head for the door on the far wall, left hand side and stand there. This ensures you’ll get the best seats in the house for the next stage of the experience. 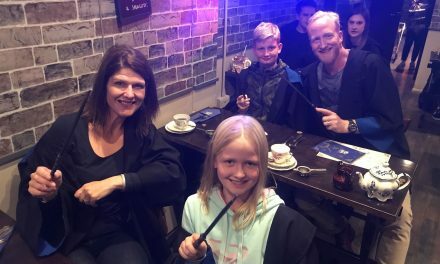 TAKE A CAMERA: There are so many photo opportunities -we got our fill of pictures taken in the great hall, at platform 9 and 3/4, on the night bus, and at 4 Privet drive, to name a few. RIDE A BROOM: You can try your hand at ‘flying’ by donning a Hogwarts house robe and climbing aboard a broomstick in front of a green screen – your photo will then be super-imposed on to a cloudy sky. It’s free to take part but there is an extra cost for souvenir photos and videos. We didn’t get chance to do this as the queues were quite long but it looks great fun! TRY THE BUTTER BEER: Half way through the tour, there is a café selling a variety of refreshments including Butter Beer ☺ I had a sip of my son’s and it’s definitely an acquired taste – kind of like a sickly sweet toffee flavoured cream soda ☺ It’s a fun thing to try and my son said he liked it! THE SHOP – Be aware that the tour filters you out into the shop, so be prepared ☺ It maybe worth setting a budget before you go. For a bit of fun we bought some Harry Potter Jelly Belly Beans (£8.95). Flavours include: Ear Wax, Rotten Egg, Vomit, Dirt, Earthworm, Booger as well as your traditional Banana, Blueberry, Cherry and Marshmallow ☺ The kids thought that they were great fun! This is an amazing day for any Harry Potter fan, and come to think of it any movie buff in general. There is so much to see! I would definitely try and get an early time slot if possible so that you can take your time and make sure you get to see everything! We were amazed by the level of detail and incredible artistry that was involved in making the films! 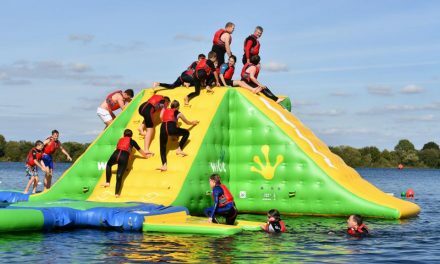 It’s quite expensive, but well worth it – personally I felt that my 8 year old was the right age and was able to get the most out of the day. This is a brilliant day out and a complete must for all fans of Harry Potter, whether it be the books or the films. COST: We bought a family ticket – 2 adults and 2 children which cost £107, plus we paid an extra £12.95 for the Group Digital Guide which is suitable for up to 4 people.